So soft and mild you can use every time you wash your hands leaving them feeling refreshingly clean. With Olive, Tea Tree & Eucalyptus Oils. The Bentley Organic Deep Cleansing Hand Wash - 250ml product ethics are indicated below. To learn more about these product ethics and to see related products, follow the links below. I used this primarily to clean my toddlers hands, as feel safe knowing this is toxic free. I've now started to use it too and have noticed a difference in my hands and nails where they no longer dry out.rnA little expensive but I feel it's worth the money, and a little goes a long way. I am really trying to find a soap that is even purer. 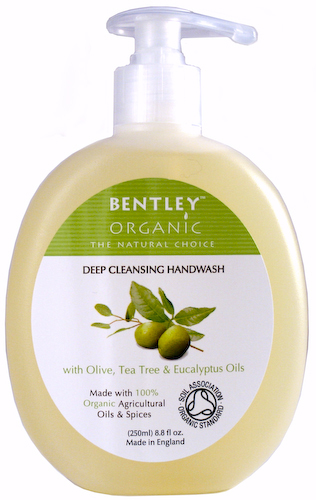 There are currently no questions to display about Bentley Organic Deep Cleansing Hand Wash - 250ml.